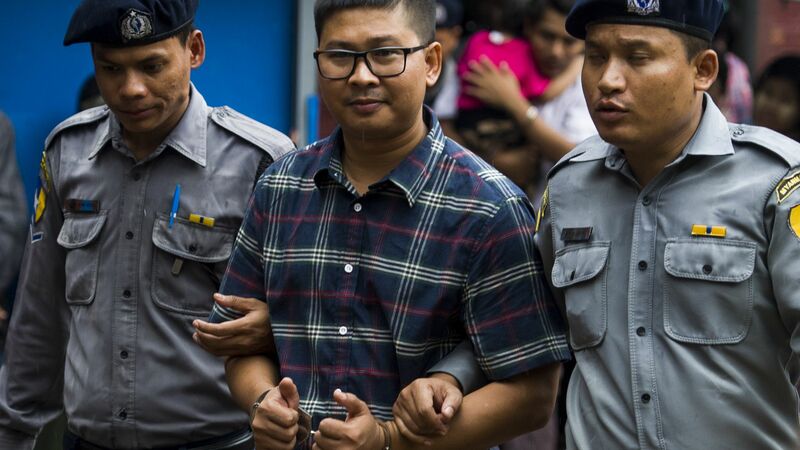 Two Reuters journalists who were arrested in Myanmar at the end of last year described being hooded and deprived of sleep during a hearing on Tuesday, Reuters reports. Why it matters: This has become a landmark case for press freedom. They're facing up to 14 years in prison after being arrested while investigating a mass-killing of Rohingya Muslims last year. The details: Kyaw Soe Oo said on Tuesday that when they were arrested, police "put black hoods on us...and we stayed hooded until we arrived" at a special interrogation site. He said his interrogators "asked questions for three days straight while I was in handcuffs." The police deny using illegal torture, Reuters reports, but the journalists' defense lawyer Than Zaw Aung said: "Asking questions repeatedly for three days without letting them sleep made them mentally weak. This kind of mental and physical torture is a human rights violation." The two say they were framed by police who handed them documents moments before their arrest. The officer in question denies doing so. Go deeper and stay updated on their case with Reuters. Quote"We wouldn’t be dutiful as reporters if we ignored these violations of the law. We covered the Rakhine issue, and because of that we have been facing trial for months and facing these troubles."